The UO can be put back on your list to fish. Water clarity is good, although it remains higher than normal. Use extra weight to get those nymphs down below your Under-Cators. Some of the access roads remain a mess due to ice, deep mud, and large puddles in the two track ruts. It gets tricky for access after the ground thaws in some sections. The cutthroat numbers remain low too NO. There are a few husky spring rainbows holding over, with decent numbers of catchable bows and browns on the warmer days. 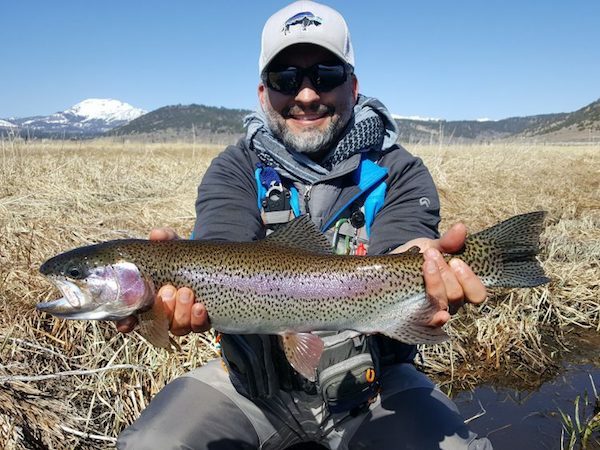 Numbers should steadily increase through April-peak around the general trout opener, with migratory fish hanging around through most of May. Crystal Eggs, San Juan Worms, #16-18 Assassins (dark and light), #14-16 Crystal Leeches, and #16-20 Copper Tiger Midge, Zebra Midge, and Gillies have been good patterns fished with plenty of weight below an Under-Cator.